← Wanna see a really big hole? 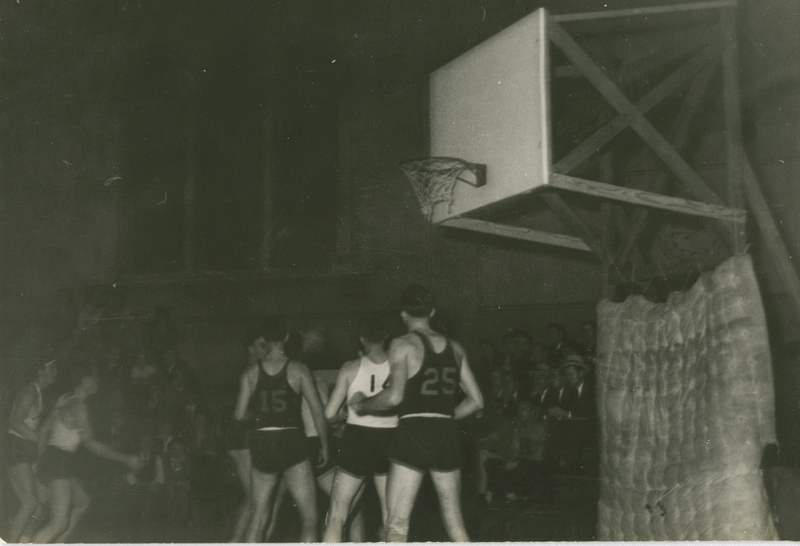 This was taken during a game in the original fieldhouse–we have very, very few of these pictures and I don’t have any good way to date it. I feel uneasy just looking at this contraption. I guess the dunk hadn’t been invented yet. BTW, you are correct, the dunk was NOT done by the time I was in school (1952-56). And Bill Russell played against Rice while I was “considering a function”. He could surely have dunked. I have heard one of the older college-later pro players say they could have done it but it was considered inappropriate. After my time at Rice, some college players began dunking, and I think it was banned by the rules for some years, but later made legal. My mind’s eye holds the picture of Bill Russell trapping a ball against the backboard in a game I witnessed at “Autry Court”. Having analyzed my mind’s eye, I now think I remember King Hill of Rice Institute trapping a basketball high against the right side of the backboard at Autry Court. I think I previously had seen that done by Bill Rusell, perhaps on TV but possibly in a newsreel. My id, ego, and superego probably morphed those 2 images together. Dunking was banned from NCAA college basketball games from 1967-76. Well, I got something right. Do I get anything for that? A free parking spot for the baseball games perhaps?